Sergeant Erynn Hazlett joined the Vermont Army National Guard in 2009. A seventh generation Vermonter, Erynn wanted to stay in southern Vermont to build her life so joining the National Guard allowed her to serve and stay in Vermont. Erynn spent her first six years serving in Logistics, including a tour to Afghanistan in 2010. Once returning, she spent her early 20’s working with non-profit’s as a leading figure for several economic development projects in Southern Vermont and Young Professional networking groups. Erynn produced independent television through GNAT-TV, helping to spread the voice and lifestyle of young people in an aging State. 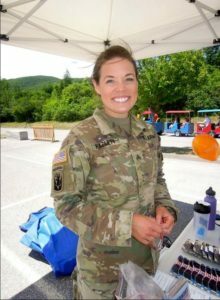 In 2015, Erynn left the civilian sector and became Active Duty for the Guard as a Recruiter and the liaison between the Guard and Castleton University ROTC program. Most recently Erynn has transitioned into a Human Resources and Training position in Northfield, VT.
Erynn believes being a female role model for current and future Soldiers will encourage more Vermont women to serve in the Armed Forces as well as develop their voice and passion to serve their communities. Once retired, Erynn plans to run for the Vermont legislature. Visit Vermont Army National Guard to learn more in state tuition opportunities, news, and how to apply.